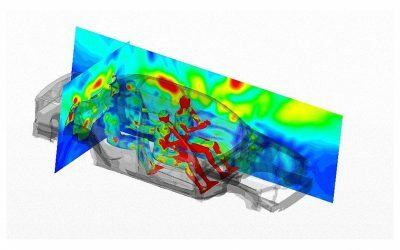 Simulation of electromagnetic field exposure. The logical first step is to use simulation to assess the likely field environment and to predict the impact of possible mitigation strategies in order to minimize the risk of excessive field exposure at the design stage. 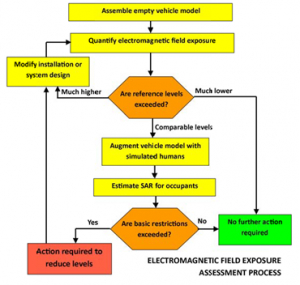 Where simulations (or measurements) indicate that the field environment is unlikely to comply with recommended field limits then anatomically detailed human models may also be included in numerical simulations in order to assess compliance with limits on in-body quantities such as specific absorption rate (SAR, 100 kHz to 10 GHz) or induced internal electric field (1 Hz to 10 MHz). For the assessment of in-body quantities, homogenous or inhomogeneous human simulants may be used depending on the frequencies and application of interest. Non-automotive applications investigated have included body-worn antennas.